In Balochistan, life for journalists and reporters is a futile attempt to find a balance between neutral reporting and death. 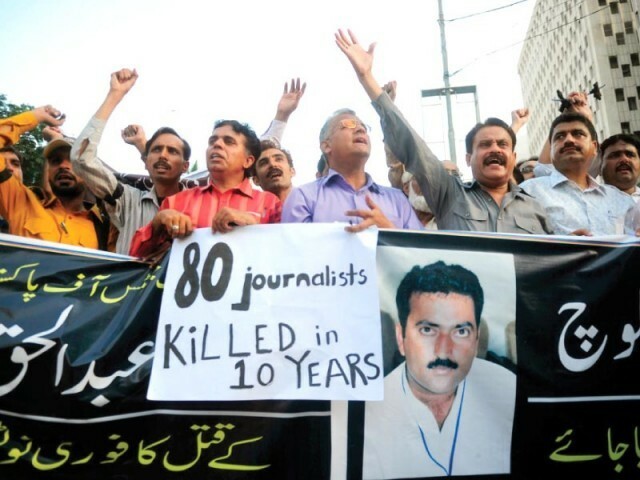 According to a report by the Council for the Protection of Journalists (CPJ), Balochistan saw the death of 8 journalists between 2003 and 2012. Of these, four were killed in Quetta, two in Khuzdar, one in Panjgur and another in Turbat. Journalists in the province often find themselves besieged by separatist groups at one side and state-backed agencies at the other. The trend has spilled into this year as well, smearing it with the death of many journalists. According to a report in The Diplomat, Mohammad Afzal Khwaja, a reporter for The Balochistan Times was shot to death along with his driver in February this year. The Pakistan Federal Union of Journalists (PFUJ) laid the blame on police, accusing law enforcement of its involvement. But the toll is far from over. In August 2014, death struck again, this time with the murder of a senior journalist and a trainee reporter. Irshad Mastoi was the Secretary General of Balochistan Union of Journalists (BUJ) and the Bureau Chief of an online news agency. They were gunned down in Kabir Building in Quetta. This year, November marked a month-long global campaign to end impunity and ensure the safety of the journalists world over. But the situation is getting only worse for journalists in Balochistan. A prominent journalist in Gwadar told PakVoices that factual reporting has become a fatal choice for reporters in Balochistan and it is not possible to independently report about any department. “If you say something critical of a given department, you will start receiving threats through various sources,” he said. He gave the example of how reporting about extortion by some Pakistan Coastal Guard personnel can result in indirect threats of violence.